Be the first to share your favorite memory, photo or story of Suzanna. This memorial page is dedicated for family, friends and future generations to celebrate the life of their loved one. 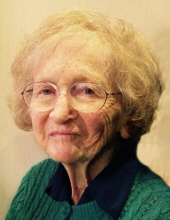 Suzanna Lengyel, 89, of Woodbridge died peacefully on January 12, 2019 in her home with family by her side. She was born on March 31, 1929 in Budapest, Hungary to the late Mihaly and Olga (Haas) Kadar. Suzanna and her future husband Peter left Hungary in 1956 after the failed Hungarian Uprising. They married in Vienna and then came to America as refugees, both 27 years old, at the end of 1956. They lived in New York City for seven years before spending a year in France and then moving to Hamden for two years and then Woodbridge in 1967. A librarian at Yale University for 40 years, Suzanna loved books and knowledge. She was an extremely social person, finding joy in meeting new people, learning nearly everything about them, and maintaining lifelong friendships. She had a knack for making everyone, even strangers, feel special. She and her husband enjoyed long walks in their neighborhood. Besides her husband, she will be remembered by her children Carole Lengyel (and husband Satori Iwamoto) of East Greenwich, RI, and Michael Lengyel of New York, NY, and grandchildren Alex, Nicholas, and Peter Iwamoto. She was predeceased by her brother Feri Kadar in 1945. Thanks to Laurie Luce, Stephen Anim-Akuffo, Lume, Diana Osei-Bonsu and Matthew Luce who were Suzanna’s caregivers in her final years. Friends are invited to visit the family home on Saturday, January 19th between the hours of 12:00 and 5:00 p.m. In lieu of flowers, contributions may be made in Suzanna’s memory to the International Rescue Committee (www.rescue.org). BEECHER & BENNETT, 2300 Whitney Ave, Hamden in care of arrangements. To send flowers or a remembrance gift to the family of Suzanna Lengyel, please visit our Tribute Store. "Email Address" would like to share the life celebration of Suzanna Lengyel. Click on the "link" to go to share a favorite memory or leave a condolence message for the family.